On a recent afternoon fighting a traffic ticket and WINNING…I decided to treat myself to lunch. I started walking uptown and before I knew it, I was in Tribeca. Mmmm, with all the options here, where should I go? My belly led me to an Oldie but a Goodie….Kitchenette. Kitchenette is a 50’s style luncheonette in the heart of Tribeca, known for their home-style country cooking and decadent desserts. When you walk in, it’s like walking into Arnold’s on Happy Days minus the poodle skirts. So I stepped back in time and grabbed a seat at the counter, in between the dessert display and the Red Velvet Cake under glass…TEMPATION EVERYWHERE. I’m feeling breakfast today but can’t decide what. 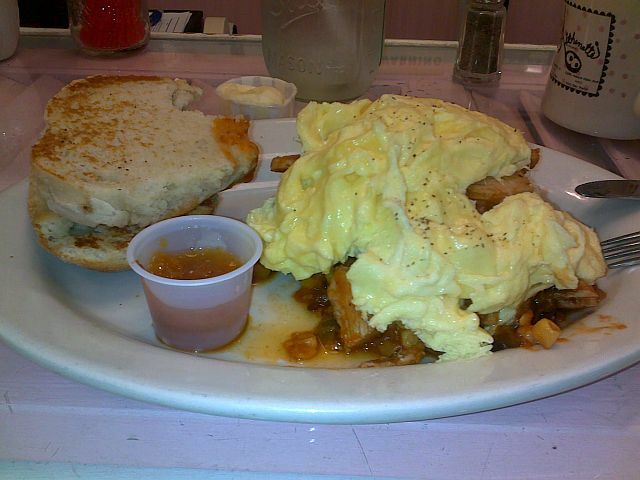 After a suggestion from my server, I decide to go with the Sweet Potato Turkey Hash and a cup of tea. As I patiently wait for my food, I chat up with the couple sitting next to me who are sitting in front of the Red Velvet Cake. We both watch the cake shrinking as slices are being gobbled up by the patrons and those taking theirs to go. Soon my food comes. Wow…this looks good. Light and fluffy scrambled eggs over hash with the volume turned up. Chunks of sweet potatoes, cubed fresh turkey, onions with a kick from chipotle peppers. The perfect combination of heat and sweet accompanied by a homemade biscuit with homemade peach preserves on the side. One word…LIPSMACKING GOOD. Oooops, that’s two. As I enjoy my food, I watch Mom’s coming in with their kids for an afternoon treat, students picking up a coffee and dessert for the ride home and locals enjoying a belly warming meal. When I can’t fit another bite in my mouth, my server clears my plate and offers me another cup of tea. My neighbor and I notice there’s only 1 piece of Red Velvet Cake left. “You think if that slice tips over, they’ll give it to us for free?” One could only hope. Then a baker appears carrying a HUGE freshly baked Pumpkin Spice Cake with bright orange frosting. As if the cake Gods were watching, that last slice of cake tips over. VICTORY!! She gives the piece of cake to my neighbors and displays the new cake. They ask for 3 forks and we savor this sweet surprise together….compliments of the house. P.S. Check out their Blue Plate Specials – MONDAY – Family Chicken Dinner for 4 with all the fixings and dessert $55. TUESDAY – Cheeseburger Dinner for 2 $22. This entry was posted by Rosemarie on Monday, November 14th, 2011 at 8:31 pm	and is filed under American/Comfort, Dessert, Financial District, Tribeca. You can follow any responses to this entry through the RSS 2.0 feed. You can leave a response, or trackback from your own site. Great review, this place sounds excellent. I wish I had known about it when I was a social work intern in Tribeca. Thanks. It is a good one. You can always head back to try it out. The desserts alone are worth the trip DT.